By this point in time, it’s fairly well-accepted and fairly well-known that Mesoamerican peoples used writing systems, the most famous being Classic Maya writing. Mesoamerica is one of the places where writing developed independently rather than being adopted from neighboring people. Besides the Maya system, there were numerous others: Teotihuacan script (which hasn’t yet been deciphered), Zapotec script (ditto), Mixtec script, Mexica (“Aztec”) script, as well as a number of early scripts that aren’t entirely understood. Mesoamerican peoples created screenfold books on amatl paper. There were at one point a lot of these, but the overwhelming majority were burned by Spaniards. Still, many are still around and they’re well-studied. What gets defined as writing is highly political, and writing systems in the Americas really deserves its own post, but I’m just going to point out a few systems of communicating information across time and/or space that get ignored because archaeologists have not (yet) deemed them to qualify under the technical category of writing: Ojibwe and other Algonkian people created wiigwaasabakoon, birch bark scrolls that recorded information such as historical stories, songs, medical instructions, recipes, and more–the most well-known are the Midewiwin scrolls that record the stories of the Midewiwin religious society. Mi’kmaq people did something similar, and in the 1600s Catholic priests adapted the system to use preach the Bible. 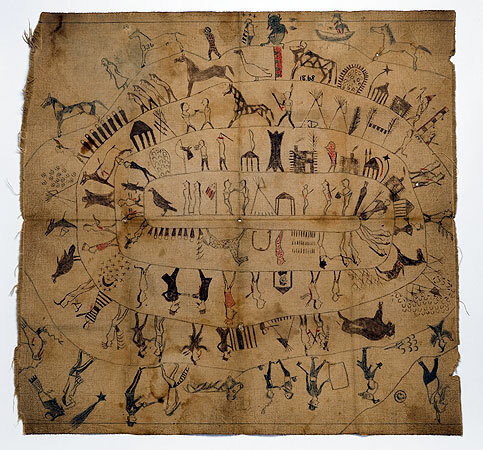 To the west on the plains, there was also a pictorial system used to transcribe history (such as on winter counts), and to send messages. There are also a few methods of recording information that seem very far from typical ideas of writing. 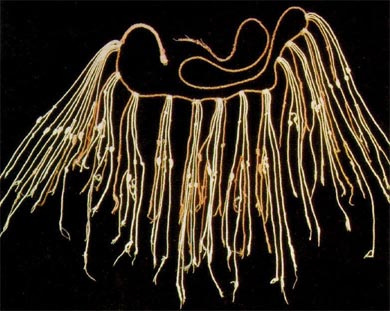 In Andean South America, groups of knotted cords called khipu were used to record mostly numerical data, but also some non-numerical data. They were essential in the administration of Tawantinsuyu (the Inka empire), and continue to be used in a few rural locations today. In the northeastern woodlands, the Haudenosaunee (and other nearby nations) used woven wampum belts to record historical information. I don’t know a lot of about it, but they were used to pass down information over generations, and were also used to record treaties and even send letters. The wampum tradition is still strong among Haudenosaunee leaders today. Native Americans wore animal skins. I think I’ve heard that in practically every description of Native peoples I’ve seen. It’s certainly true that animal skins and furs were major players in Native clothing, but often lost in these imagined pictures of deerskin-clad Natives are the truly fantastic textiles that they created. Most clothing in Mesoamerica was made from cotton, and indigenous people in the region are still to this day known for their beautiful, colorful cloth weaving. Pueblo people in the American southwest also made clothing out of cotton. Andean people made clothing out of cotton (on the coasts) and llama wool (in the highlands). All three of these traditions (and in reality, they’re not three traditions but a multitude of different traditions each) continue today. In the eastern woodlands, especially the southeast, people made cloth out of plant fibers such as nettle, milkweed, dogbane, and various kinds of bark. Buffalo-hair textiles were also common, and on the Atlantic coast people wove cloaks made of turkey feathers (also made in the southwest, I believe). The Mississippians and their descendants used quite a lot of this cloth–though it has been often ignored because textiles don’t survive well in the southern climate–and it continued to be a major method of making clothes until the 1700s when European textiles mostly supplanted the indigenous tradition. Throughout the eastern part of North America a unique kind of weaving was used known as fingerweaving, which is unusual because it doesn’t require a loom and each strand becomes both warp and weft. Fingerweaving produces long thin cloth and was especially used for garters, sashes, straps. It continued to be used and actually increased in popularity after the introduction of European yarn, and it became a major symbol of the Metis nation in the form of the Assomption sash. A lot of Metis people, including myself, continue to practice fingerweaving. Weaving was also prevalent among west coast peoples, though I’m unfortunately less familiar with that area. 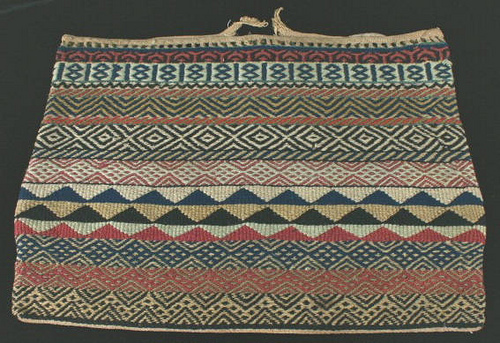 Woven skirts and hats were one of the most common clothing items among coastal peoples. 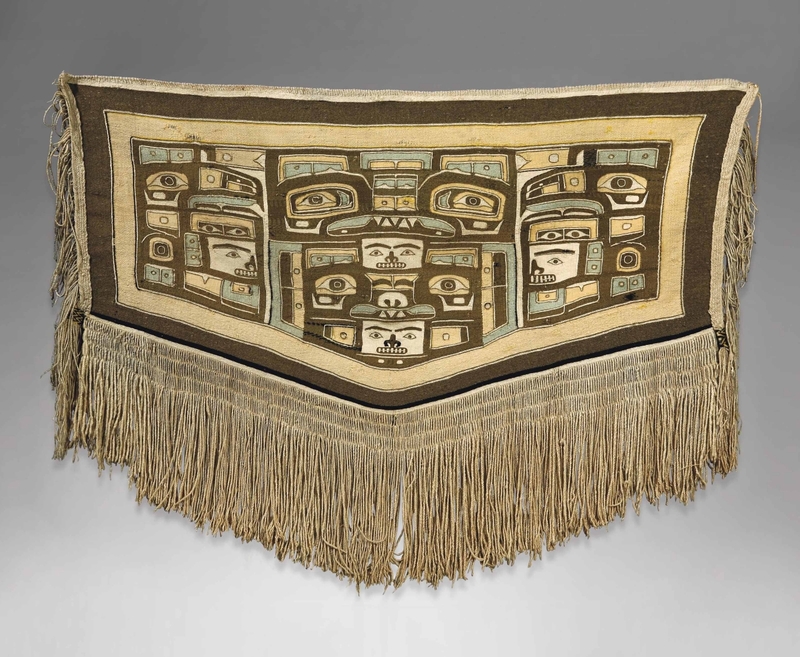 And then there’s chilkat weaving, which was made from mountain goat hair, dog fur, or cedar bark and made into the incredible designs that the Pacific Northwest nations are famous for. In recent years there has been a major revival movement in the area to keep practicing these forms of textile creation. Copper and gold were both very common in the Americas before Europeans arrived. The gold is well-known in some ways, since that’s what made the Spanish want to invade so badly. Metallurgy in South America had early developed into a complex artform, complete with smelting technology; gold, silver, electrum, bronze, and tumbaga were all used. Initially metalwork was mostly used for decorative purposes to display status, but by the time of the Inkas had become common for utilitarian purposes as well. By 800 CE smelting technology had spread north to Central America and Mesoamerica, where it was particularly specialized in West Mexico. By the time of the Triple Alliance, the Mixtec peoples were known as the best goldworkers in Mesoamerica. Copper was an important metal in the Pacific Northwest region as well, where much of it seems to have come from sources up in Alaska. Iron from Japanese ships that washed ashore across the Pacific has also been documented both archaeologically and through indigenous oral traditions. There are also suggestions that there may have been trade across the Bering Strait over a long period of time. Early European traders discovered that metals were one of the most highly desired trade goods among the indigenous people there, and worked sheet copper became an important feature of potlatches. Government concern over the “destruction” of valuable copper was in fact a major factor in the banning of potlatches and indigenous ceremonies in the northwest. Traditional designs in metalwork is being revitalized today by many indigenous young people in the region. It is fairly well-accepted that American slavery of the 19th century developed from three distinct traditions of slavery that were mutated into a new, racialized, institutionalized form: European indentured servitude, West African slavery, and southeastern Native American slave trading. Of these, the last is probably the least well-known, despite it being essential to understanding how slavery as it’s popularly known became such an economic force in the southeast. So this is a brief overview of southeastern slavery before 1800. The period from 900 to 1700 CE in the southeast is known as the Mississippian period. During this time, people lived primarily in provinces composed of towns that paid tribute to a mico, or chief, who inherited his position through the maternal line. Power was established through deeds of war, so provinces frequently fought with one another. As a part of this, captives were often taken, although frequently in earlier times even women and children were killed rather than taken captive. These war captives were given to wealthy people in the provinces for workers. Being a slave was defined by being not a part of the kinship system, which was essential to society. Lacking kinship connections, slaves were isolated. However, by adoption or marriage they could become part of a clan and thus leave their state of slavery by entering the kinship system. This was the state that the Southeast was in when Hernan De Soto visited it with his army. During the years after his visit, Mississippian society began to disintegrate for reasons that aren’t totally understood. De Soto, whose army was used by some micos to attack other chiefdoms, may have destabilized relationships between provinces, or disease may have spread in the aftermath. Internal pressures likely played a part. Regardless of why, the fact is that by the 1600s, people in the Southeast were living far more spread out, often on more isolated farmsteads. Though clan, kinship, and micos continued to be important, their role was different than it had previously been. It was the entrance of the English trading system beginning around 1650 that sparked the creation of intensive slave trading in the south. The English needed workers for their plantations in the southeast and in the Caribbean, and Native people desired European goods both for an advantage in war and for prestige in their community. In order to acquire these goods, several Native communities began to focus heavily on raiding for captives to sell to the English. In the north, the Haudenosaunee were the most feared raiders; in the south the Occaneechis and Westos became major slave traders. Later more interior groups such as the Chickasaw would take over. Between the constant slave raids and disease, huge changes occurred in the Southeastern world, with entire societies devastated from the population loss. This wasn’t a minor thing, it was a region-encompassing issue that affected the lives of practically every indigenous person. In the wake of this, new confederations appeared, both to engage in the slave trade and to protect from it: the Choctaw, Chickasaw, Cherokee, Catawba, and others emerged with new political systems. These groups fiercely defended their claims to large tracts of land in the interior, keeping Europeans on the coast. By the 1700s, there was a demographic crisis in the Southeast, and Europeans had begun important enslaved Africans at a significantly higher rate to keep up with their needed labor power. Multiple groups began to develop racialized senses of self at this time. Natives in the east frequently espoused the idea that the Creator had made three races–White, Red, and Black–and had given each their own place as a way to defend their right to their land. However, as slavery of Africans became more institutionalized and Native elites became more acculturated, this same rhetoric was used to assert that Black people were inherently enslavable. Despite this, Indian and Black people continued to work as slaves in fairly significant numbers alongside each other up until the Removals of the 1830s, while Native people also continued to own Black slaves until emancipation three decades later. For Europeans, one of the original concerns that led to focusing on slavery of Africans rather than Indians was the fact that escaping from slavery was much easier when one had a community to escape to. The close intertwining of Black and Indian communities thus threatened the system of slavery as a whole. In addition, the land owned by Indian people was highly desired by white colonists. The forced removal of Indian people opened space for larger plantations and severed the ease with which enslaved people could escape. (Which isn’t to say that Black people were necessarily treated well in Native communities–the later the period, the more Native communities in the southeast had developed and adopted anti-Black attitudes. “Running away to Indian Territory” continued to be remembered as a path to freedom all the way into the 20th century, though.) It was this process that allowed the creation of the massive plantations of the 1800s. The ways that slavery and colonization of Native American lands are intertwined are only starting to be examined relatively recently, due to the removal of Native people from the east and their subsequent erasure from eastern history, and the general lack of study of Black-Indian relations. Both of these things are major gaps in the popular understanding of American history that need to be rectified.